Refractory, or the lining utilized on the interior of rotary kilns, is a critical component in ensuring process efficiency and prolonging the life of a rotary kiln. Here, we’ll discuss everything you need to know about refractory, including how it works, the different types, and best practices for preventative care. When is Refractory Needed in a Rotary Kiln? Rotary kilns employ high temperatures to cause a chemical reaction or physical change in a material. In most cases, these high operating temperatures would immediately destroy an unprotected carbon steel shell. For this reason, refractory is used. Only direct-fired rotary kilns employ refractory; in an indirect-kiln, heat transfer occurs primarily through the kiln shell wall. Refractory would be another barrier for heat to pass through before it is in contact with material, reducing the efficiency of the process. Because of this, instead of using refractory, indirect-fired kilns typically rely on a more heat resistant shell. Further necessitating the need for refractory, direct-fired kilns typically do not utilize combustion chambers, so the flame is in constant direct contact with the internals. Flame temperature can typically range anywhere between 1600 – 3200℉ (depending on excess air) – a harsh processing environment that carbon steel is not capable of withstanding. As the skeleton of the system, protecting the shell is paramount to prolonging the life of the equipment; a major repair or total replacement of the shell is a substantial undertaking, requiring significant downtime and repair costs. For this reason, choosing the right refractory configuration and taking measures to protect that refractory once operational is critical. While the main objective of refractory is to protect the kiln shell, refractory also serves to minimize heat loss. A kiln with sub-par refractory may protect the kiln shell, but allow significant heat loss, reducing overall process efficiency and increasing operational costs. There are two main types of refractory: castable and brick, each with distinct advantages and disadvantages. Castable refractory comes in a powder form and is mixed with water on-site. Before the mixture can be put in place, anchors are installed. These y-shaped anchors are similar to rebar in cement; they help give the castable lining its strength. Once these anchors are in place, the cement-like mixture is pumped into the lining of the rotary kiln, and allowed to cure for several days. Castable refractory is being poured into the door of a rotary kiln. Y anchors can be seen. Besides lower overall cost, the advantage to using castable refractory in a rotary kiln is that it is usually easily patched when a problem is encountered. Down time is typically minimal, because the problem area can be cut out and new refractory poured into the cavity. The disadvantage to using castable refractory in a rotary kiln is that it is very susceptible to installation problems. When castable refractory is expertly installed, it can nearly match the quality of brick. But if installed incorrectly, there can be a considerable difference in quality, and the life of the refractory can be severely compromised. Brick is fired in a furnace under tightly controlled conditions that allow it to achieve better properties than a similar composition castable refractory. Although slightly more expensive than castable, brick does not require anchors, and it’s quality is superior, but as mentioned, incurs greater install costs. When processing a highly abrasive material, brick refractory is advisable most of the time, as castable does not have the durability to stand up against abrasive materials as well as brick. The disadvantage to brick refractory is that it is kept in place much like a roman arch: bricks are held in place by the pressure of the other bricks pushing against each other. When a problem is encountered, typically the failed brick needs to be replaced, but when one brick is relying on the bricks around it to hold it in place, often one cannot replace just one brick, and whole sections of the refractory must be replaced. Unlike castable refractory, the repair of a fail in brick refractory is much more involved. There is more to refractory than just the choice of material; refractory is a customizable part of rotary kiln design and can be tailored with multiple layers to meet the demands of a given application. When efficiency is of great concern, or when extreme temperatures are involved, it is common to employ both a “working” layer, and an “insulating layer.” Layer thickness can also vary, with total refractory thickness generally falling between 4.5” – 12”, pending process temperatures.. The working layer is the layer of refractory that is in direct contact with the material being processed. This layer is a dense, durable lining designed to withstand the high temperatures within the rotary kiln, as well as the constant abrasion from the material. When it comes to refractory, the more dense it is, the less insulating capabilities it has. This means that even though there may be a working layer in place, the heat can easily pass through it to the shell of the rotary kiln. For this reason, an insulating layer is needed beneath the working layer. The insulating layer serves as insulation to protect the shell of the rotary kiln so the high temperatures within cannot reach the shell and damage it. 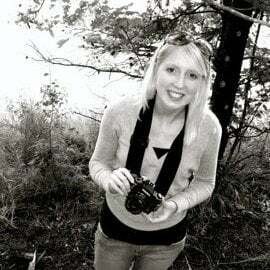 Typically the working layer and the insulating layer are made of the same material (ie. brick or castable), with varying chemistries. The working layer tends to be a higher density, stronger material that is more conductive. The insulating layer does not need these qualities, and tends to be softer, lighter, and less conductive, therefore more insulating. These two layers often vary in thicknesses, determined by the needs of the rotary kiln and what material is being processed. 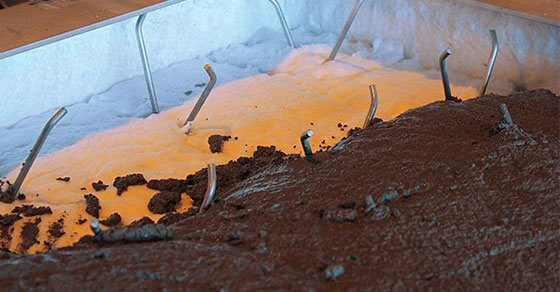 In some cases, such as when temperatures are fairly low, or when efficiency is not a concern, a single working layer may be all that is needed. In contrast, when insulation is extremely critical, an optional third layer of ceramic fiber backing may be used. This thin, but very efficient layer is similar to fiberglass insulation found in a house, but it is much more compressed. The decision to employ this layer comes with some responsibility. Should a crack in the refractory occur and go unnoticed, it is possible for the high heat inside the rotary kiln to reach this backing and burn it up. This would create a gap between the refractory and the shell of the rotary kiln, which would cause disastrous problems. Due to this potential of increased risk, this third layer is not always appropriate. 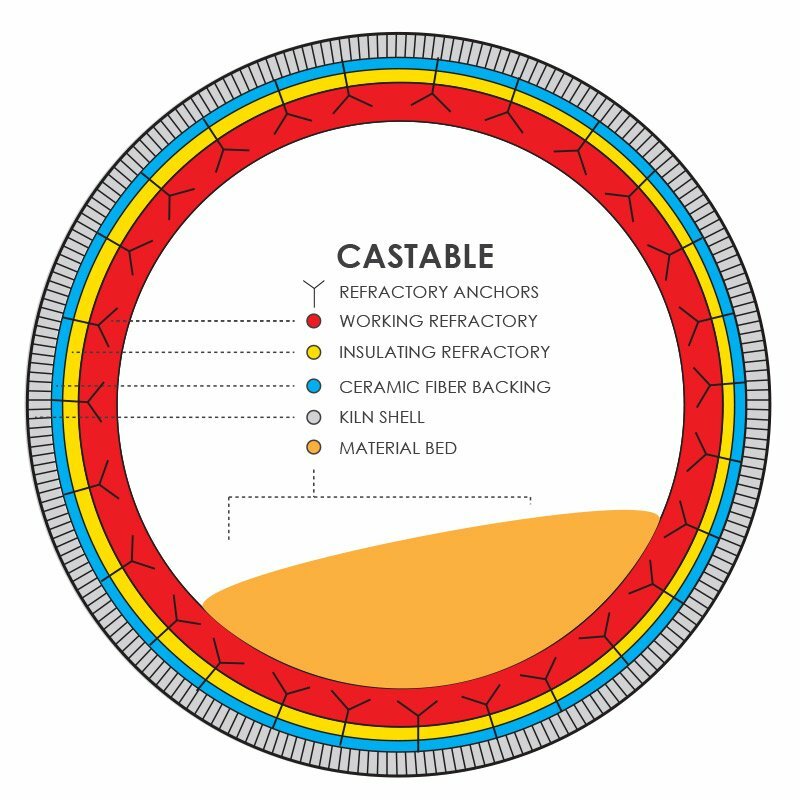 The image below illustrates a castable refractory configuration with a working layer, insulating layer, and a ceramic fiber backing (click image to view larger). 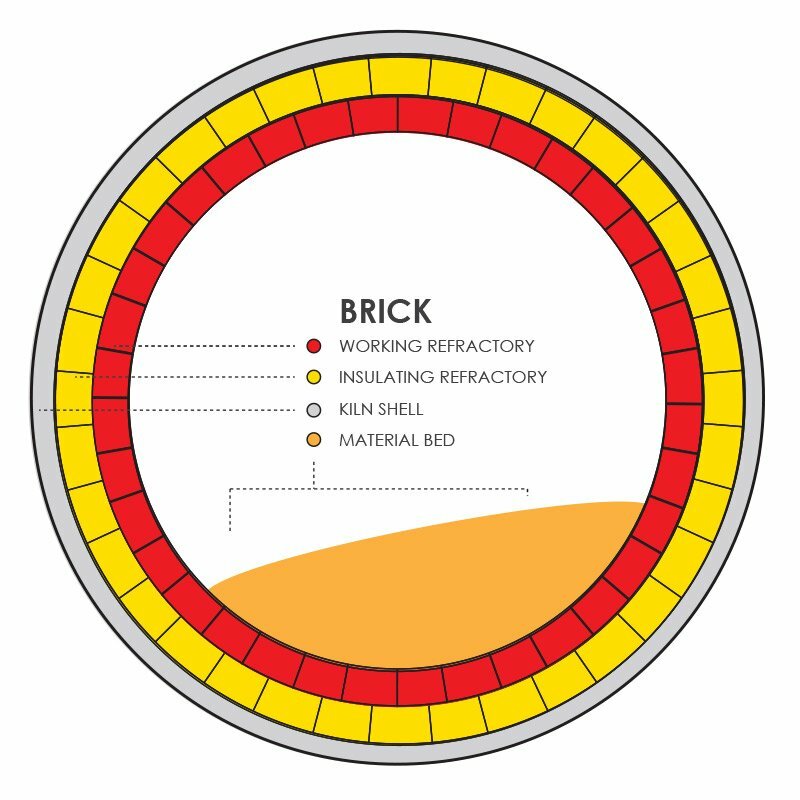 The image below shows a typical brick refractory configuration with a working layer and an insulating layer (click image to view larger). The processing environment within a direct-fired rotary kiln can be harsh. The combination of constant rotation, extreme temperatures, heavy loads, and abrasive and corrosive environments, has the potential to cause significant damage or catastrophic failure to a kiln’s shell. Once your rotary kiln refractory is installed and in use, it is important to take the extra steps to ensure it is properly maintained. A well-installed, high quality refractory can have a lifespan of many years, but there are factors that can cut refractory life short. While early signs of refractory failure can be hard to spot, the good news is, many of the things that can cause refractory failure are preventable. The two primary causes of refractory failure are cycling and chemical incompatibility. The biggest source of refractory failure is what is called cycling. Cycling is simply the heating up and cooling down of the rotary kiln. Each time the rotary kiln is heated, the refractory expands with the drum, and as the kiln is cooled, the refractory retracts. 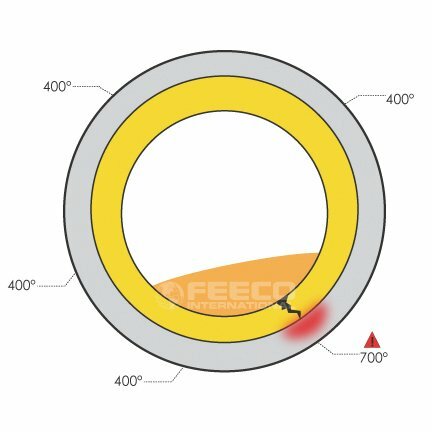 If a kiln is constantly being turned on and shut down, the refractory can easily become stressed, resulting in cracks. Similarly, cracks can also occur from heating or cooling the kiln too quickly. To maximize refractory life, it is important to try to reduce cycling as much as possible, keeping shut downs to a minimum. Another common source of refractory failure is chemical incompatibility. Refractory is not designed to be able to withstand certain chemicals. A good example of this is chlorides. Chlorides can aggressively attack refractory, causing excessive wear because of their corrosive nature. When these chemicals are identified up front, refractory can be designed with this in mind to help reduce the potential for excessive wear. 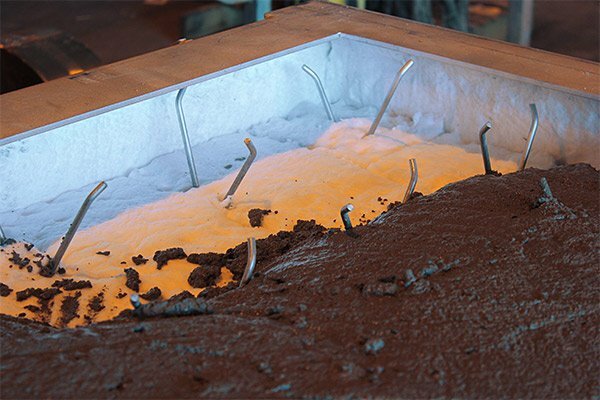 Similarly, unknown components in a material or a change in feedstock can also result in excessive wear on refractory. Routine inspections are considered a best practice with any type of equipment, but are especially important when working with extreme temperatures. Operators should be well-versed in the proper operation of the kiln and what to look for to spot potential problems. Operators and maintenance personnel should always follow the guidelines for safety and maintenance set forth by the original equipment manufacturer. Regularly observing the kiln to check for any visual, auditory, or other abnormalities can mean the difference between a small repair and a catastrophic failure. As part of routine observations on the unit, the kiln shell should be regularly measured with a temperature gun to check for hot spots. This can be done by picking a spot on the rotary kiln shell, and holding a temperature gun in place. As the rotary kiln rotates, that spot should read the same temperature for the entire circumference of the shell. For example, a temperature reading of 400º, 400º, 700º, 400º would likely indicate a failure in refractory. Left untreated, this could lead to severe damage to the rotary kiln shell. The image shown here illustrates a refractory failure indicated by an inconsistent circumference temperature reading. In addition to circumference temperature being the same in a given location, there should be a gradual shift in temperatures from one end of the kiln to the other, not a drastic change. Catching these problems early is important to minimizing the potential for damage. Additionally, having a service technician visit the site to observe and inspect the kiln every so often is also considered best practice in preventative maintenance. Depending on what the original equipment manufacturer recommends, this is generally on an annual basis, but may be more frequent for especially demanding settings. Refractory failure can have disastrous results. Even a small crack can allow heat to reach the rotary kiln shell. It is important to routinely temp gun the exterior of the rotary kiln shell, ensuring that the temperature is consistent for the entire circumference of the drum. As the only barrier between the shell and the kiln interior, protecting and maintaining refractory is of the utmost importance in order to prolong the life of the equipment and avoid potential catastrophic failures. 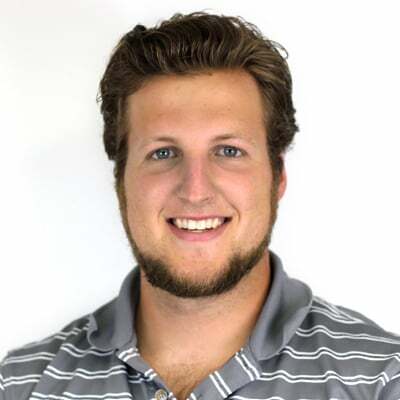 Alex Ebbenis a Process Sales Engineer and thermal processing expert.